Showing results for tags 'YearlyTBorg'. 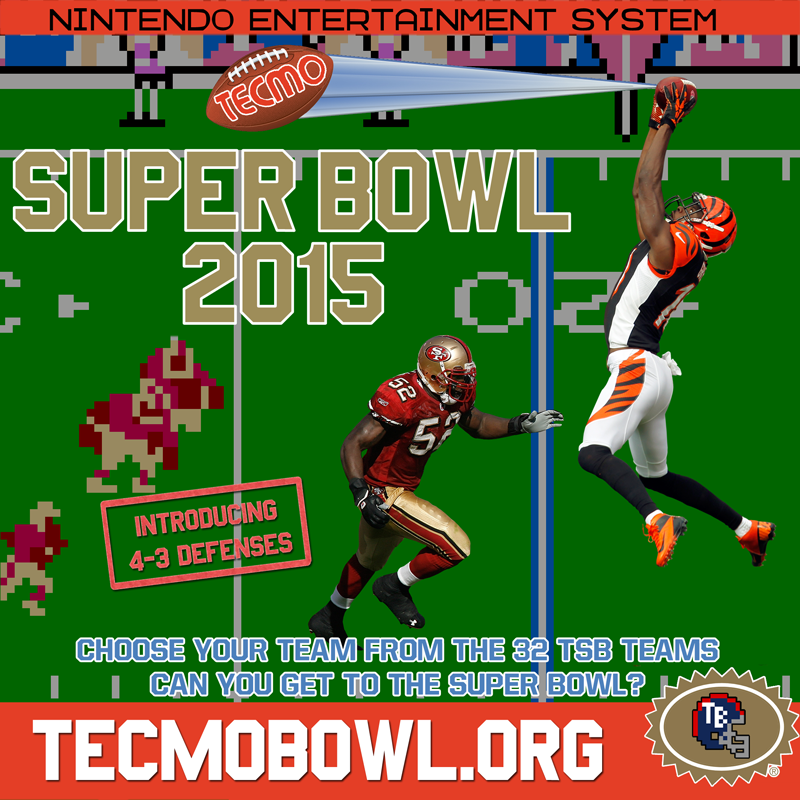 -= DOWNLOAD HERE =- Tecmo Super Bowl is the greatest sports video game of all time. Now, 23 years after TSB made 8-Bit legends of Bo Jackson and Lawrence Taylor, TecmoBowl.org proudly announces the release of Tecmo Super Bowl 2015. This site's 8th yearly iteration updates Tecmo's NES classic with up-to-date rosters, graphics, schedules and play books for all 32 NFL squads. Additionally, the 4-3 defense has been added for teams who run this base defense. Playable on multiple platforms and operating systems via NES emulation software, Tecmo Super Bowl 2015 brings Nintendo's bone-crunching classic to today's computers and handheld devices. Will offenses fear Patrick Peterson like they feared Rod Woodson? Who is the more deadly play-caller: Peyton Manning or Joe Montana? Will Matt Schaub have a Grogan-esque ending to his career? Loaded into an NES Emulator, Tecmo Super Bowl 2015 will make legends for the next 23 years. Tecmo Super Bowl 2015 Table of Contents A. How This Works B. How To Play - PC/Mac C. How to Play Online - Windows D. Tecmo Super Bowl 2015 Notes E. Credits F. Other 2014-15 versions available A. How This Works If you're new to emulation: ROM = Game or Cartridge (.nes file) Emulator = NES System B. How To Play - PC/Mac Download Nestopia for your platform and also the .nes ROM. Open Nestopia. From Nestopia, File > Open and find your .nes ROM. C. How to Play Online - Windows Setup for online play using our guide - http://tecmobowl.org/topic/53066-guide-get-started-playing-tsb-online-for-dummies/. We then recommend starting out at the TPC - http://www.tecmoplayers.com. Most TPC players use the original Tecmo Super Bowl ROM, but you might be able to find some people playing TSB 2013. Remember that the versions of the game must be exactly the same or you will not be able to connect. If you’re looking for an online league, we recommend TecmoBowl.org's Online Tecmo Leagues. D. Tecmo Super Bowl 2015 notes 4-3 Defenses - Several teams employ 4-3 defenses. The The "RT" (Right Tackle) will show up as the LILB on the rosters. 32-Team ROM Rosters current as of 9/2/14 Adjustable quarter length Playbook editing in-game Player 2 attributes now display correctly Halftime stats Passing Accuracy hack is different from last year. Pass Control determines if a pass will be completed. Passing Accuracy determines if the ball will be on target. Quickness now works. This will be the maximum speed of a defender if they pick up a fumble or make an interception In order to get the proper Pro Bowl players, you may need to reset the season from the Schedule menu ProBowl rosters are based on the new fantasy "Rice vs Deion" format. At this time you are not able to replace players from either conference. E. Credits Graphics - Keithisgood Rosters/Attributes/Sim - Buck 4-3 Defense - Jstout Roster QA - Nathan @ Retro4ever.com, Bruddog Promo - davefmurray QA/Rom Merge/Project Coordinator - Knobbe F. Other 2014-15 versions available The TecmoBowl.org release is purposely similar to the original in terms of player ratings and limit of hacks included. There are some other great yearly releases that implement many of the hacks and different styles that have evolved over the years. We suggest you try them out. Tecmonster's 2014-15 Release: Includes a laundry list of hacks and a preview magazine QBVIKINGS 2014-2015 Release for the NES and SNES: "This rom has max juice. If you can get Oak-Town or Jax to the playoffs, you are a stud." - "This rom includes too many hacks to mention Thanks to: Jstout, Bruddog, Cxrom, Bad-Al & Buck for the hacking knowledge and tools. Members of TecmoBowl.org for helping to beta test and for making this all worthwhile.